This story starts with the building of a power-line east and west between State Highways 18 and 177 a mile north of Chandler. One member of the construction crew was Bill Duke, a man with a historical sense and the intelligence to be curious. When he found a gravestone in the corner of the fence line that day in early November 2013, he came back the next day with a camera and took a photo of it. 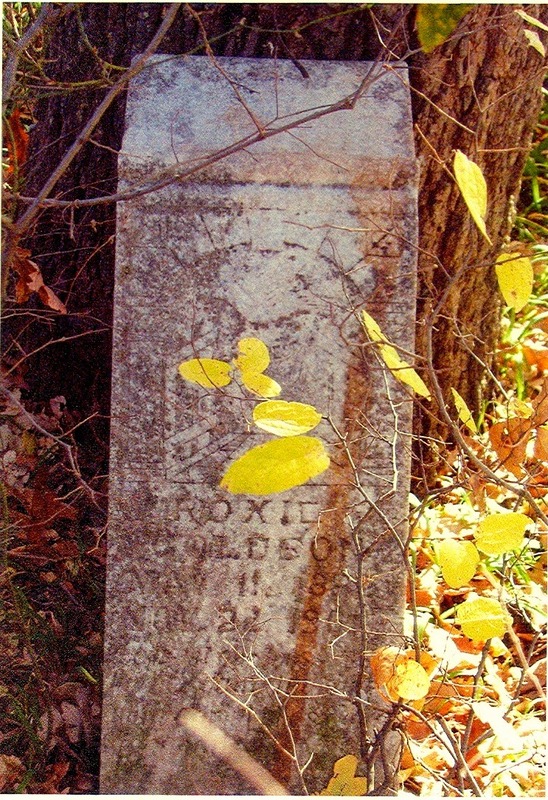 He thought the epitaph said “Roxie Goleson,” but was unsure of the dates. The yellow leaves of early November undergrowth are visible in the photo. It was a morning in mid-August of the next year when David Alsip and I started out in his Ford 4X4 truck to look for Roxie’s stone. Bill Duke had reported to the County Historical Society that it was near Sweet Home, a black community northwest of Chandler. David and I spent the first morning looking for the Sweet Home Cemetery. Luckily, at a truck stop on the highway, we ran into a descendant of Sweet Home’s most important bootlegging family. He readily told us how to get there. It’s a large and still active cemetery built on a hillside, which we tramped out, but there was no state-built power line on that section line, and we found nothing to our purpose. The next morning we started from David’s home, located on what we had always called the Lake Road but recently re-designated the 890 Road to help tornado spotters give directions. This time we ignored the red herring of Sweet Home and found the power line that ran east and west. It wasn’t possible to follow the line due west because the section line was blind after the second mile. We had to dogleg a mile south, then a mile west, and back north to recover the 890 road. 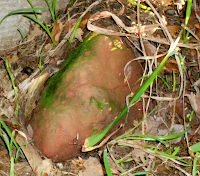 We were reasonably sure that the stone would be inside the fence line, otherwise it would have been in the right-of-way maintained by the county and long since reported, so we searched both sides of the road looking for undergrowth tall enough to hide it. At the previous corner, we had passed a house whose owner David knew--Freddie Lynch--and it occurred to David to call him. He used his cellphone to call his wife, who looked up the number and gave it to him. Davie and Freddie must have known each other pretty well, as I noticed they dispensed with polite palaver. David explained that we were looking for a gravestone and had just passed Freddy’s house. Freddy said sure, he knew where it was. Come back and get him and he’d show us. He thought it was a Civil War stone. Freddie led the way, and the two of us climbed his fence, fighting the wall made of blackjack, whose lower limbs grew downward, and the thorny brambles, which grew upward. Ten feet further on, the clean lines of the granite stone came into view. It was leaning 30 degrees, supported by a large tree behind it. We had to brush away a coat of moss to read what was incised there: Roxie Goldson, we made out, 1882-1901. 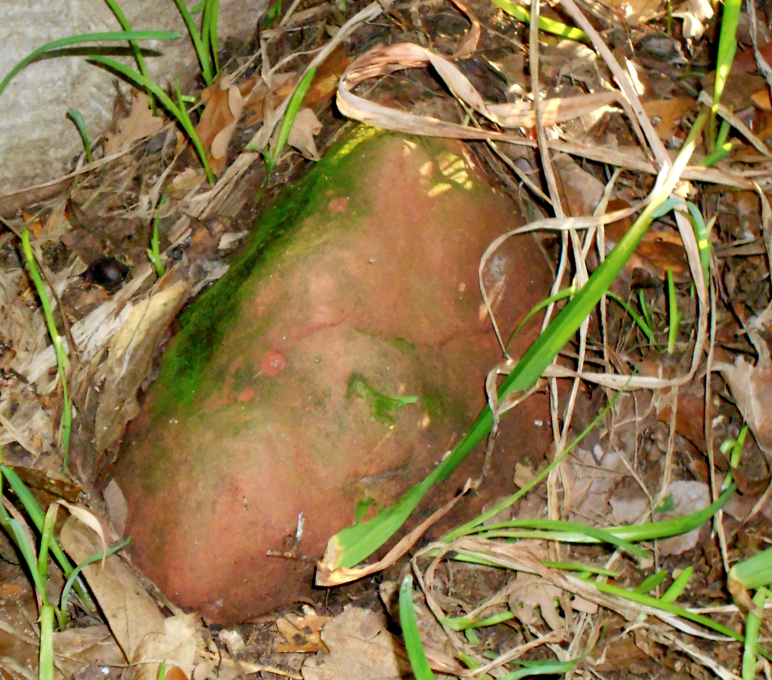 Beside it, more than half buried in the red-clay soil were what appeared to be two field stones, as we grave-seekers call them--two small boulders of native stone, which in central Oklahoma means sandstone. When we got back to David’s truck, I noticed that Freddy’s forearms were bleeding from pushing through the underbrush. He wiped off the blood with a handkerchief from his overalls pocket. I came back the next day by myself with an ax and a shovel, and cleared around the field stones enough to be sure there was no visible writing on them. A few weeks later, after studying the census and land records, I decided that these marked the graves of Roxie’s parents. Fortunately, Roxie had been picked up by the 1900 census, which gave her parents names as Frank and Alice Goldson. It also said they were black. The censuses for 1900 and 1910 show Frank Goldson as born in Missouri, but an earlier record shows him born in Carroll Parish, Louisiana. He was probably born near the Mississippi River, which divides Carroll Parish, as it was called at that time (now East Carroll) from Bolivar County, Mississippi. Both of the censuses show Alice as having been born in Louisiana. Alice was probably literate, as it is remarkable that all the family names on both censuses are perfectly spelled, and it is she who would have supplied this information to the census taker. In 1863 Frank had joined the Louisiana Colored Infantry, and in 1864 was serving with Co. C, 47th Regiment. The United States Colored Infantry seems to have begun in Louisiana in late 1862, just before the Emancipation Proclamation. Approximately 175 regiments composed of more than 178,000 free blacks and freedmen served during the last two years of the war. By the war's end, the men of the USCT composed nearly one tenth of all Union troops. 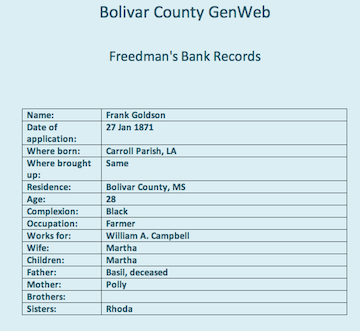 An 1871 Freedman's Bank record from Bolivar County is the source for my statement that Frank was born in Carroll Parish. It also gives his parents’ names as Basil and Polly Goldson. Sometime before 1871 Frank married Martha, who bore him a daughter of the same name. This first wife must have died in that decade, for in 1881 he married Alice, with whom he had four children that are known: Corine, Mary, Roxie, and Daniel. Probably about 1897, he and Alice homesteaded on 80 acres in McKinley Township, Lincoln County. The patent was proved on 12 March 1902. It included two lots in addition to the 80. Alice was alive in 1915, as a pension application record exists for that year. On December 17 of that year, she applied as a widow, allowing us to date Frank’s death. Alice must have died before 1920, when her name disappears from the census. Of the four known children, the eldest child, Corine Goldson, married a man named White (first name unknown), and her children include Blanch, Hoyt, and Dorsey. It is thought that these children used their mother's maiden name. The name of the second child, Mary, doesn’t appear after 1910, probably indicating that she married. The fourth child was a son named Daniel, born in 1883. He married a woman named Lillie and had two sons, Alphon and Ezra, but again they disappear from the records after 1910. Two members of this family have relatively permanent records. Roxie’s granite stone fixes her name, though one can’t help wondering where the money came from to pay for it. Since the 80 acres was sold in December of 1903, eighteen months after Roxie’s death, speculation suggests they may have sold one of their two tow lots to pay for the fine stone, though if so the deed is not published. They must have loved their nineteen-year-old daughter dearly. Frank Goldson has no name on the sandstone that marks his grave but nonetheless his name is registered in a way that is permanent. It is inscribed on one of the many brass plaques that commemorate black soldiers in the African-American Civil War Memorial in Washington DC. No doubt, other African-American soldiers buried in Lincoln County have their names inscribed there as well. I have not verified the records in Washington for all these veterans, but elsewhere on this site I have noted some of the cemeteries where they are buried. A few have the standard Civil War marker of plain marble supplied by the federal government for all veterans of that war. Some have ordinary markers. Some, like Frank Goldson, have nothing more than the blank of a field stone.